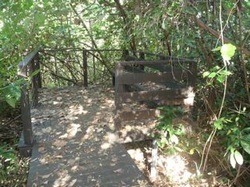 The 1996 establishment of Nelly Bay Habitat Reserve, an area of open and monsoon woodland, and littoral and beach scrub straddling Nelly Bay Road between Magnetic Island Kindergarten and the old helipad, arose largely out of a desire by local residents to protect important bird habitat – particularly that of the Bush Stone Curlew (Burhinus grallarius) and the Pied Imperial Pigeon (Ducula bicolor). The area includes an ephemeral creek and associated freshwater pool. 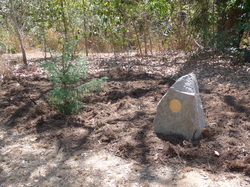 Appreciating the fact that the area of the habitat was only one of many sites on the island that would benefit from protection, especially in the light of increasing pressure for urban development, the residents decided that the time was right to establish an organisation that would work to protect and care for the Island's precious but fragile environment; and so was born Magnetic Island Nature Care Association. 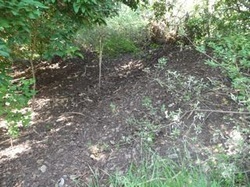 Nelly Bay Habitat Reserve is managed under an agreement between MINCA and TCC, and is the site of regular weeding and maintenance activities by MINCA members. Foster community involvement in the implementation and on-going maintenance of the reserve. 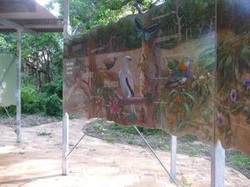 Soon after its establishment, a number of interpretive panels, painted by Island artists Gavin Ryan and Vonnie van Bemmel, were placed at the Reserve. Left of centre on the panel depicted at right is a Pied Imperial Pigeon (Ducula bicolour), a large, fast-flying white pigeon with black wing tips and tail. The gregarious fruit-eating birds spend winter in the rainforests of Papua New Guinea. In September, they fly south to Australia’s tropical coast and offshore islands such as Magnetic Island, to breed. Formerly known as Torres Strait Pigeons, they are most easily seen in flight or by tracing their call, a loud deep 'coo woo' usually heard in the early morning or late afternoon, The parents and offspring migrate to Papua New Guinea in April. The panels depict a range of Island wildlife as well as traditional cultural issues, and provide relevant environmental information. Tucked away in a quiet corner of the Nelly Bay Habitat Reserve is a memorial to founder member of MINCA, Peter le Grand, who died in 2009. At the gathering to remember Peter, MINCA planted a hoop pine and unveiled a plaque embedded in a rock. The octagonal plaque reflects Peter's fascination with the shape, which he incorporated into much of his unique woodcrafting - from tables and planters to the house which he built at Horseshoe Bay.